This is one of then endotercisus on which mornings could be for voting and afternoons not, or vice-versa. On this day the ancient Romans celebrate Vertumnalia, a festival in honor of Vertumnus, the god who managed the change of the seasons and also held the secret by which flowers are transformed into fruit. The Olympian god Vulcan-Hephaestus is also honored, significantly, on this day, of the Sun's entry into Virgo. Some astrologers have long posited the existence of an undiscovered planet Vulcan, said to be the true ruler of Virgo. This is the sixth day commemorating Odin's Ordeal on the world tree Yggdrasil. In Greece, this day was known as Aedesia's Day. Aedesia, a fifth century female philosopher of the Neo-Platonic school, was famous also for her virtue and her beauty. She was honored today. Feast of Montu occurs on the 5th day of Paopi. Because of this god's association with the successful King Nebhepetre Montuhotep I (or II, same king), who ruled during Egypt's 11th Dynasty, Montu (Mentu) achieved the rank of state god. Montuhotep the first reunited Upper and Lower Egypt after the chaos of the First Intermediate Period. His association with Montu is obvious from his name, which means, "Montu is satisfied". Sun enters Virgo. The Month of Isis. The creative and healing power of the female. This is the season of the early harvest, and of the ripening of the main harvest, symbolized by the ear of wheat and the bunch of grapes -- alternately, an ear of what and a sickle -- that the Virgin holds. If Cancer favors sideways movement and Leo always likes an advance, the Virgo season, until 9/23, is for the moves of Vulcan and the Virgin: painstaking, disciplined work until one gets it done; and the wise, deliberate walk of the woman who knows that when she possesses the greatest treasure of all, the continuity of life itself, she will best be judicious in deciding to whom she will open it. This is why the Virgo season, with the Virgin nearing the Western horizon, is best for teaching the Map of Love, for the Education of the Virgin, in the night sky. One excellent symbol of the Virgin's power is the Strength card in the Tarot. 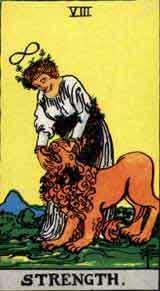 The young woman is not prying apart the jaws of the Lion (Leo). Rather, the Lion gently holds her hands within his jaws to represent perfect balance (Libra) between physical strength and the spiritual strength of purity. Virgo is one of the biggest constellations of our solar system, and represents the harvest goddess presiding over the sky at the time of shooting stars, vacations, heat waves and the grain harvest. According to Allen (Star Names, Dover 1963), Eratosthenes and Avicennus identified Virgo with Isis, holding the young Horus, or the wheat ears that she dropped to form the Milky Way. Neumann believed what Inanna was the grain goddess depicted by the stars. Virgo was known in the Attic dialect as Kore, the Maiden. In Ionia, she was called Spicifera Virgo Ceres, the Wheat-Bearing Maiden. Depictions of the constellation Virgo show a woman holding an ear of wheat in one hand and a palm branch in the other. In the sky, she is flanked by two serpents (Hydra and Ophiuchus), so it's possible the famous relief of Demeter is an image of Virgo rising. The constellation was known by many other names including Persephone, Demeter and Ceres (the confusion of these names is not surprising since Demeter and her daughter were sometimes called the Two Goddesses and seen as doubles of each other). She was also known as Arista, Harvest or Arista Puella, the Maiden of the Harvest. The brightest star in the constellation is Spica, ear of corn, which is found by following the curve of the Dipper through Arcturus (the first bright star after dusk, overhead); at the end of the arc on the southern horizon is Spica. In August, the constellation sets in the west just after sunset. the cool evening, slipping quietly into the western sea. In 1942, Pope Pius XII proclaimed this day in honor of the Immaculate Heart of Mary and in 1945 he established this holiday of devotion to Mary in her compassionate aspect. Both were acts of spiritual warfare, designed to pose Mary and Catholicism as supreme weapons in the battle against godless Communism. In 1954, the same Pope, who was clearly a Mary worshipper, proclaimed Mary the Queen of Heaven, honoring her with the title once associated with Isis. Interesting that this all happened the day before the Sun enters Virgo, the constellation that honors the Divine Feminine. It was inevitable that a Christian feast honoring the Virgin Mary be placed on the day of the Sun's entry into the sign of the Virgin, and that's why the feast of Our Lady, Queen of the Angels -- the tutelary saint of, among other things, the city of Los Angeles -- is celebrated on August 22. The Order of the Rosy Cross was founded on this day in 1623. The Rosicrucians are a legendary and secretive Order dating from the 15th or 17th century, generally associated with the symbol of the Rose Cross, which is also used in certain rituals of the Freemasons. Several modern societies have been formed for the study of Rosicrucianism and allied subjects. Many argue that modern Rosicrucians are in no sense directly derived from the "Brethren of the Rosy Cross" of the 17th century, though they are keen followers thereof. According to the legend, the Rosicrucian Order was founded in 1407 by a German pilgrim named Christian Rosenkreuz (1378 - 1484), who studied in the Holy Land under various occult masters. During his lifetime, the Order was alleged to be small, consisting of no more than eight members. When Rosenkreuz died in 1484, the order died out, only to be "reborn" in the early 17th century. This legend is accepted to varying degrees by modern Rosicrucians, with some accepting it as literal truth, others seeing it as a parable, and yet others believing Rosenkreuz to be a pseudonym for some more famous historical figure (Francis Bacon is often suggested). According to a lesser known legend found in Masonic literature, the Rosicrucian Order was created in year 46 when an Alexandrian Gnostic sage named Ormus and his six followers were converted by Mark, one of Jesus' disciples. From this conversion, Rosicrucianism was born by fusing primitive Christianity with Egyptian mysteries. Rosenkreuz would therefore only have been initiated into and become the Grand Master of an already existing order instead of being its founder. In point of fact, what was known in the early 17th century as the "Society of Rosicrucians" (Rosenkreuzer) was most likely a number of isolated individuals who held certain views in common (which apparently was their only bond of union). There is no trace of a society holding meetings, or having officers. So far as the numerous works are concerned, it is evident that the writers who posed as Rosicrucians were moral and religious reformers, and utilized the technicalities of chemistry (alchemy), and the sciences generally, as media through which to make known their opinions. Their writings included a flavour of mysticism or occultism promotive of inquiry and suggestive of hidden meanings discernible or discoverable only by Adepts. The publication of the Fama Fraternitatis Rosae Crucis (1614), the Confessio Fraternitatis (1615), and The Chymical Wedding of Christian Rosenkreutz (1616) caused immense excitement throughout Europe, and they not only led to many re-issues, but were followed by numerous pamphlets, favourable and otherwise, whose authors generally knew little of the real aims of the original author (and doubtless in not a few cases amused themselves at the expense of the public). It is probable that the first work was circulated in manuscript form about 1610, according to historical records, but if so, there was no mention of the order before that decade. In fact, research indicates that all three documents, including the concept of the Rosicrucian Order, were probably the creation of theologian Johann Valentin Andrea (1586-1654), although his authorship is only confirmed for the Chymical Wedding, which he subsequently described as a Ludibrium. The authors of the Rosicrucian works generally favoured Lutheranism as opposed to Roman Catholicism. Others, like John Heydon, admitted they were not Rosicrucians, but under attractive and suggestive titles to their works sought to make Hermeticism and other curious studies more useful and popular, and succeeded, for a time at least.